Environmental racism is violence – one of several forms of structural violence impacting the souls, spirits, minds, and bodies of African Nova Scotian people. Africville and present-day cases of environmental racism in this province are rooted in a legacy of colonial violence in Nova Scotia and Canada. 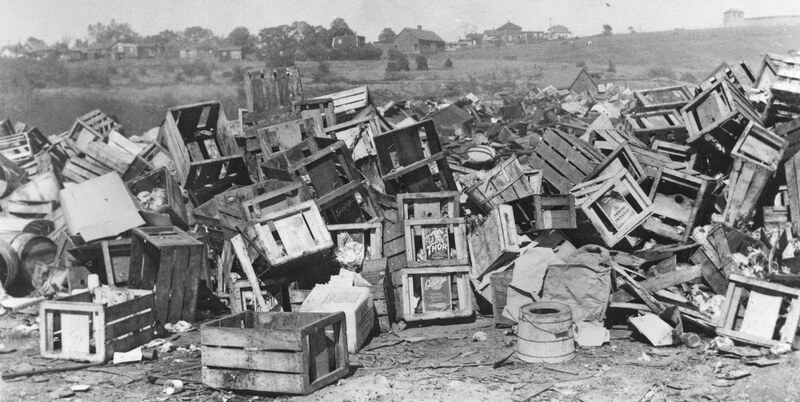 Wooden boxes piled high at the old city dump. Africville is in the background and the Rockhead Prison can be seen at top right. It is important to situate environmental racism within broader social, economic, and political inequalities that disproportionately impact African Nova Scotian communities in this province through racist policies, as well as the absence of policies for addressing structural harms in this community. Environmental racism doesn’t manifest or operate in isolation but, rather, in partnership with other forms of structural violence to disproportionately harm African Nova Scotian communities. While Africville represents a historical example of environmental racism, its intergenerational manifestations and impacts can be witnessed and felt today in other forms of structural violence disproportionately impacting the African Nova Scotian community. These include alienation from an educational system that often sets African Nova Scotian learners up for failure and fails to prepare them for university education and a competitive job market; under-employment and unemployment; income insecurity and poverty; food insecurity; residence in under-resourced neighbourhoods; substandard housing; gentrification; negative and harmful media representations of the African Nova Scotian community; and criminalization. Recent cases of gun violence in the African Nova Scotian community not only point to a need to address the underlying structural forms of violence impacting this community, but also shed light on how ongoing criminalization of African Nova Scotians leads to disproportionate rates of racial profiling and over-policing, incarceration, and the sanctioning of harsher treatment in the criminal justice system. This must be attributed to a general failure to consider and empathize with the emotional, psychological, and physical impacts of ongoing structural violence in the African Nova Scotian community and to a general perception of Black people as lacking in worth, value, and humanity, on the one hand, and as strong, invulnerable, and impervious to pain, on the other hand. Therefore, I urge health professionals and decision makers within Nova Scotia’s health system to consider and begin to address in more forceful ways the toll that a legacy of environmental racism and other structural forms of violence has taken on the souls, spirits, minds, and bodies of African Nova Scotian people throughout the province. Ingrid Waldron is the director of the Environmental Noxiousness, Racial Inequities & Community Health Project (ENRICH Project) which looks at the social, economic, and health impacts of environmental racism in African Nova Scotian and Mi’kmaw communities. Next Post Weekend video: In whose backyard? May God bless you for the amazing work!